When it comes to pediatric surgery, every experience can be different. Some children that come to our children’s clinic have issues that are simple to fix through pediatric surgery. Others have particular issues with their health and require some adjustments in our treatment. This is especially true for children that need to undergo an exam under anesthesia. Why Does my Child Need an Exam Under Anesthesia? We have this option for children for many reasons, but the main reason is for the comfort of your child. When your child begins to experience health issues, we know just how scary it can be for both the parents and the child. We do everything we can to put everyone at ease, and with our exams under anesthesia, we believe that we can best assess what further steps need to be taken with your child without disturbing or traumatizing them. Depending on what body part is undergoing the exam, different steps are taken during this time. With certain exams, tissue is removed and biopsies will be taken, and in some cases, a part of the health problem is addressed. Anything found in the exam will be explained to you by your pediatric surgeon, and the next steps will also be discussed with you as well. No, your child will be placed under anesthesia that will make them sleep. Post-exam discomfort is common, but it’s typically mild at the worst. Is further surgery always needed? It depends on what was found during the exam. Once the exam is complete, your pediatric surgeon will create a report and a plan for your child. This plan will be discussed with you in depth to ensure you fully understand what is needed for your child. Eight hours before the surgery, your child should be on a clear liquids only diet. If your child is formula fed, cease feeding six hours before the surgery and go on a clear liquids only diet. Four hours before surgery, cut off all liquids from diet. Any further directions will be discussed with you. Depending on which body part is being examined,what procedures are being taken, and what biopsies are gathered, the time it will take is varied. Generally, these exams take anywhere from 30 to 45 minutes. Upon arrival, you child will be prepared for their pediatric surgery. We will give your child an IV for fluids and any medications he or she will need. The type of medicines will be discussed with you prior to the surgery. Every pediatric surgery and exam can pose a few potential risks. These risks include bleeding and infection, as well as the potential need to re-do the surgery. 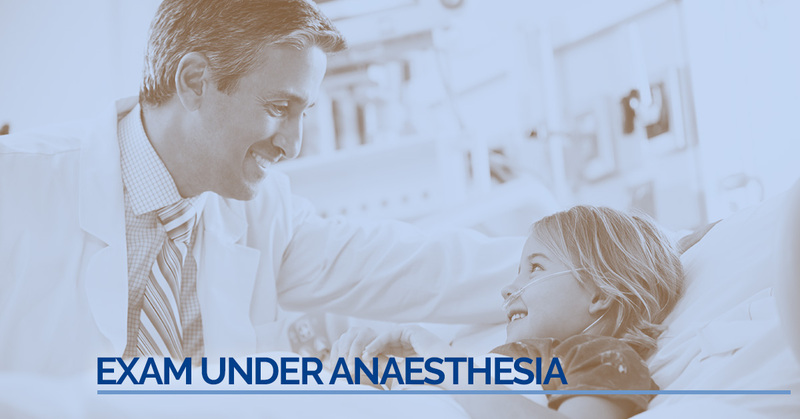 In addition to that, common risks with anesthesia are a reality as well. However, most procedures we perform are successful, and we rarely see these issues with our patients. Exam under anesthesia is an outpatient surgery, meaning the child can generally go home the day of the surgery. Depending upon the surgery your child had, specific directions for healing and avoiding infection will be provided to you. If your child begins to experience a higher than normal temperature or you notice abnormal bruising or swelling, it’s important that you contact our pediatric clinic right away. Other issues you should also pay attention to are increased redness or drainage around the surgery site, nausea or vomiting, and bleeding or increasing pain. If your child’s health is suffering and they are experiencing pain or discomfort, be sure to bring them in to see our pediatricians. Our pediatric surgeons and staff are educated and eager to help bring comfort to your child’s life. We understand just how worrisome it can be to have your child experience medical issues, but having a pediatric clinic you can trust can help ease your fears. If you’re in need of a pediatrician, please don’t hesitate to contact us. You can rest assured that at Alaska Pediatric Surgery, your child will be in the right hands. Make an appointment today.